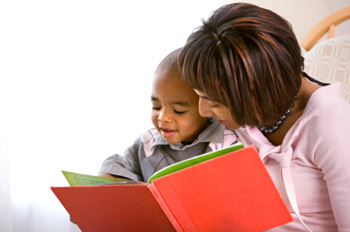 Teaching young children how to read can be very rewarding because beginners are often excited about reading. Use the following techniques and strategies to help your child read. When introducing letters, teach your son or daughter the sound each letter represents. Most young children know the alphabet, but many letter names are different from their sounds. The sounds each individual letter can make often vary word to word, as well. Use magnetic letters to create words and help your child sound the words out. When your child gets a bit more advanced, give her or him three letters of a word and say the word. Your child must put the letters in order to spell the word. Do this over and over so that your child learns through repetition. Move on to more complex words when it's appropriate to do so. Make sure your young child can identify letter sounds in whole words. For example, if you say the word 'bat,' your child should hear that it starts with the 'b' sound and ends with the 't' sound. If your child is struggling, focus on sounds before moving on to reading. Practice by pointing to a letter and repeating the phonetic sound several times. Have your child repeat after you. Reading to and with your child from the youngest age possible is a good way to create a positive reading environment in your home. Sit with your child and read books as often as you can. This will not only get your child used to reading, but also help your child's imagination develop. It's usually important to be patient, positive and understanding when teaching a young child how to read. Include fun activities in your reading lessons in order to maintain your son or daughter's interest. Make sure you give your child plenty of time to learn new skills so he or she doesn't get frustrated. Even at a young age, it's possible to help your child read by laying a foundation for reading comprehension. When you read to your child, ask him or her questions about the text. For instance, you may ask something like, 'What do you think about the main character?' and 'How did the ending make you feel?' Discuss what may happen later in a text or what may have gone differently if a central character had made different decisions. The earlier your child is able to think about texts analytically, the easier it's likely to be for her or him to master comprehension later.